Fitness myths are abundant. Like knats, they’re everywhere and persistent! We are all in search of the most fitness benefit with the least amount of effort which is why so many of us get sucked into the “Lose 20 pounds in 2 days!” headlines promising quick and easy results. But there are no shortcuts. A well-balanced, well-thought-out plan is the best plan. Be sure to educate yourself before engaging in any fitness plan. Muscle turns to fat when you stop exercising. Apples and oranges. Two different things and one can’t turn into the other. The same is true for muscle tissue and fat tissue. Muscle tissue revs your metabolism and if you stop exercising, you lose muscle mass which slows your metabolism so you gain weight. Your body will swap muscle mass for fat tissue but one doesn’t change into the other. Lifting weights will make me look like Arnold Schwarzenegger. I hear this claim from women often and the truth is, the average exerciser won’t train hard enough to make this happen. That requires a tremendous amount of training time and intensity. Many women have the illusion they are getting bigger when strength training because they still carry a layer of fat over the muscle. As they continue to build muscle they look bulkier. Focusing on a balanced fitness program and healthy nutrition will help you get lean and not bulked up. Running will ruin your knees. I can’t even count the number of times someone has said this to me! Running is an efficient, cheap and readily available cardio exercise that almost anyone can do. As long as you have a properly fitting pair of shoes, you ease into the running and have a well-rounded strength training plan, you should be just fine. People you have pre-existing knee conditions should probably steer clear of running and other high-impact activities as these could aggravate the problem. No type of exercise is completely injury-proof, however, if done properly, running should not cause knee problems. “I exercise so I can eat whatever I want.” The bottom line is, if you eat more calories than you burn, you will gain weight. Everyones metabolism is different and everyone requires nutrients in slightly different proportions but a healthy diet has to be part of an overall fitness program. If you take the time and energy to exercise, why would you negate all your hard work by filling up on junk food? You can’t out train a bad diet. You can spot-reduce certain body parts. Wouldn’t this be fabulous if it were true?! Your metabolism works as an overall body system, not a collection of individual parts. So doing 500 crunches a day will not whittle your waist. When your body burns calories, it works allover. Simple as that. No Pain, No Gain. Someone who is very out of shape will certainly have discomfort and soreness whenever they begin something new. Even someone in great shape that pushes themselves hard will have some soreness at times. Muscle soreness after a particularly intense training session is not unusual. And lack of soreness doesn’t mean the workout wasn’t effective. But acute pain is a sign that something is not right. Pay attention to your body during and after exercise. If you’re having pain not related to general muscle soreness, back off and have it checked. If staying healthy is the goal then being in pain is not leading to that goal! There are many, many myths about fitness out there and these are only a few of the more common ones. Think twice when you hear something about fitness that just doesn’t seem right or seems too good to be true. Do you need different kinds of workout shoes for different kinds of workouts? You run. You strength train. You take Zumba classes and do yoga. Athletic shoes are expensive. Can you use the same pair for all your fitness activities? Grabbing any pair of shoes off the rack, or from the back of your closet for that matter, is not a good idea. There are specialized types of shoes for almost every kind of workout designed for the needs of that type of activity. For example, the extra cushioning and support in a running shoe would break down faster and become ineffective if you also wore them for strength training. While you don’t have to buy out the shoe department you should invest in a few different pairs if your fitness routine includes a variety of activities. If one activity is your go-to workout most of the time, you definitely need shoes specific for that activity. Walking – Your foot-strike during walking is different then when running. Walking shoes are designed with more heel support. If walking is your primary form of exercise, a good walking shoe is a good investment. Running – If you plan on running more than just a warm-up you need running-specific shoes. There are dozens of different running shoe features that provide support based on how you run and what kind of running you do. Have your running form evaluated at a specialty running shoe store to get the most effective fit and shoe type. Strength training – There are specific shoes for lifting but you probably won’t find them in a typical sporting goods store. Unless you are a very serious lifter, specialized strength training shoes are probably not necessary. A good cross trainer will do the job. Court Sports – Shoes made for sports like basketball or tennis have built in lateral and ankle support for motion in a variety of directions. If these kinds of activities are your primary exercise then these shoes are a must. Group classes – a cross trainer shoe has a multi-purpose outsole and a moderate amount of cushioning. These shoes are general purpose shoes. They are good for a variety of activities done in moderation. They are excellent for group classes, cardio machines like an elliptical or stair climber and strength training. No matter what type of shoes you wear, take care of them and replace them when they wear out. If your shoes get muddy or dirty during a workout, clean them and let them air dry completely before wearing them again. Over time shoes lose cushioning and structural stability. This can lead to aches, pains and injuries. Shoes should be replaced at least once a year and possibly more often depending on how much you work out. If you’re anything like me and exercise regularly, you have multiple pairs of shoes. I have a bit of an athletic shoe obsession! 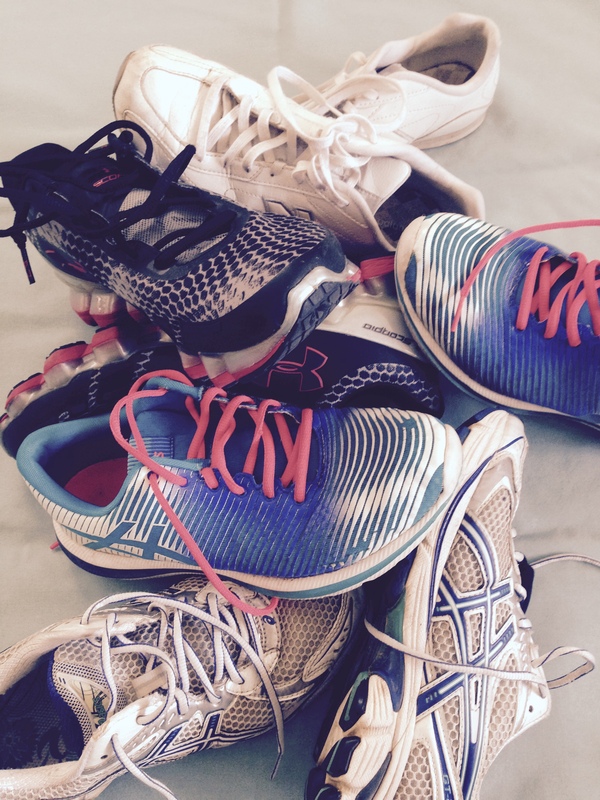 Let me know what kinds of exercise shoes are in YOUR closet! Welcome and thanks for looking around my site! So why a fitness blog and why a whole website on fitness for that matter? There are hundreds (or maybe even thousands, actually) of fitness sites on the web and most of them have great information. I may even do a future list post on all the great sites I’ve found just so I can share all that information with you. My fitness life started when I was young. My parents grew a lot of our food in the backyard so I ate pretty healthy even as a kid. I think they did it mostly for financial reasons but the health benefits became more clear to me as I got older. My father has exercised regularly for as long as I can remember and my sister and I did various sports starting in elementary school. My college degree is in exercise science and it was in college that I really started to realize the impact that a fit life could have on people. Ever since then I’ve been in the fitness industry in one way or another. When my youngest child (of 3) was born, hubby and I decided I should stay home instead of continue to teach PE (which was what I was doing at the time). Since we needed to cut back on expenses, a gym membership was out of the question so I set about trying to find a way to get a good workout in my family room or basement. Along with that, I begin really thinking about the foods I was feeding my family and the influence it could have on, not only their physical health but their mental well being. Kiddo number 2 deals with anxiety and I quickly discovered that a healthy diet helped her manage her anxiety better. And let’s face it, I think we all know that when kids eat a lot of junk they don’t feel well…physically or mentally. This blog and website evolved out of that personal need because I realized that even though there are too many great resources out there to count, only a small percentage of them were solely devoted to fitness at home. Thank you for joining me and looking around. Let me know if there’s something you want more information about or if you have questions.